Amy Grant, Vince Gill, Don Schlitz and other special guests are taking part in the 19th annual Alive at the Bluebird concert series on Jan. 26. The songwriting series benefits Middle Tennessee’s Alive Hospice. Pre-paid reservations for the show are available to the public on the Bluebird website for $75. The series continues through the end of January featuring shows from Shane McAnally, Allen Shamblin, Kent Blazy, Karyn Rochelle, Victoria Shaw, Gary Burr, Matraca Berg, Barry Dean Lori McKenna, and Bob DiPiero. 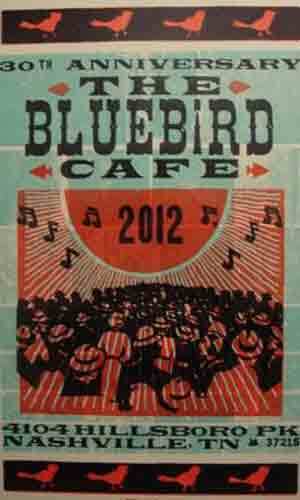 The Bluebird Cafe also recently introduced a new Hatch Show Print celebrating its 30th Anniversary. The print is available through The Bluebird Cafe’s website and in person.